The bait is back in town! And the fish feeding has gotten better every day, and will continue to get better as we enter June. Inshore, schools of pilchards can be found early morning near the bridges or along the beaches. Always be on the lookout for diving birds when looking for bait. Earlier the better. I’ve been throwing a cast net with 9 foot diameter and ½” mesh to avoid cleaning out gill-netted minnows and tiny pilchards. The finger mullet and silver mullet should be showing up more through June. The 10 inch silver mullet are the best bait for the summer tarpon found early-morning at the crossroads and evening at the inlet. For sabiki bait, the Sand Pile and Bullshark Barge are good places to try for greenies, threadfin herring, and Spanish Sardines. Once the bait wells are loaded, it’s time to find some fish. 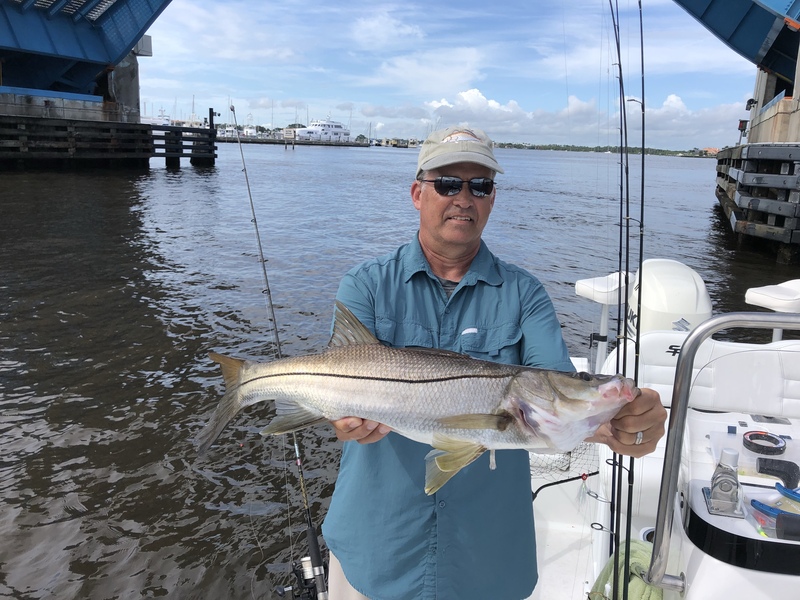 Snook season is closed, but June is always a great month to pitch baitfish along the up-current sides of the rock-piles at the St. Lucie Inlet to fight a big snook and carefully release them. Fish can also be found along the sandy shorelines inside the inlet and along the beaches. At these sandy spots, I like to cast artificial baits such as “Giles Jigs”, YoZuri Crystal Minnows, DOA CAL jigs, and Storm Shads. 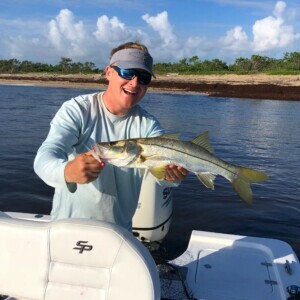 Pitching baits against the up-current sides of the bridge abutments is also a method to try for snook, redfish, goliath grouper, snapper, and more. For those anglers without a boat, a great summer method is to walk the beach with a spin rod or fly rod casting those same artificials. I prefer somewhat high tide when fishing the beach, seems to bring the fish closer to shore. A great walk is always from Bathtub Beach south to the St. Lucie Inlet. It’s about 1 mile but always worth it. 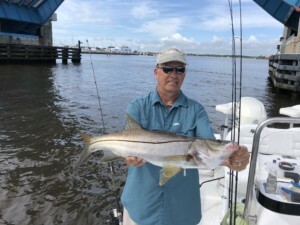 The cobia bite has turned on at the Sandpile with the sharks, and along the wrecks in 30-60 foot depth. June is also a great month to try for permit at these same spots with live crabs. Just free-line the crab on a hook or 1/8-1/4 jig head.